So Windows Phone 7 haven’t been out for a long time and we have already started to see some hacks from around the web. In this post series, I’ll list the hacks and tips that I test myself on my Samsung Omnia 7. As a result I won’t be held responsible for you screwing anything up with your machine. *#2222# some debugging stuff that I couldn’t figure out. By going to the Diagnosis mode showed in the previous section, and typing *#7284# you will get the choice to change the connection to the PC from Zune sync, to Modem Tethered Call or Modem Usb Diag, more coverage about tethering here. You need to note that using the device as a modem will enable you to connect your PC to internet using the phone’s network, I couldn’t reach this in France, since the dial-p numbers for SFR don’t seem to work for me (*#9# or *#9***1#). Also, on Windows 7 x64, the phone won’t be detected, I suspect that the drivers are not signed and Windows reject them, hence you need to try the above method on a 32bit Windows. Here is a screenshot for Samsung Omnia 7 installed as a modem on a Vista x86. SD-Cards, are they seriously dead once put on a WP7 phone? There have been a lot of talking about this one, and how magically Windows Phone 7 locks sd-cards so they become unreadable and cannot be formatted on any other machine. It turns out that Symbian devices can actually format WP7 sd-cards, so if you got a nokia, you are clear, all your sd-cards are useful again, more on the topic here. It seems it will happen soon, some developers out there are claiming access to the wp7 filesystem, let’s hope it will happen soon, more here. A very strange but true fact about wp7 and the Zune software, is that, when you use Zune to download apps from the Marketplace, you can sniff the traffic sent and returned to Zune to intercept the url of the application xap (a zip file containing binaries and resources of the app). Once, this xap is downloaded (yeah, MS servers just give you the app happily without any authentication or anything), the DLLs could be disassembled to retrieve the original source code, using a tool such as .NET Reflector for example. Today, a small hack showed that wp7 can be mounted as a normal usb drive, but unfortunately, you can only copy files *from* wp7, I tried to copy files to wp7 including music and pictures, but it didn’t work, you can’t also create new directories neither. Well, now it seems I am able to copy files into the phone :D. No, no, it is back, I cannot copy files into the phone, need more investigation it seems. Voila! just close that cursed Zune thing and the phone will show up as a USB driver as showed in the following pictures. If you need assistance with pictures (!!) here’s a detailed post about it. It has been almost a week I am trying a new device, the Samsung Omnia 7, which runs the new Microsoft’s OS Windows Phone 7. It took me a lot of time to get one after the very chaotic launch of the new OS in France, but well, finally I’ve got one. In this post, and the ones that will follow, I’ll describe my experience with the new OS (the device too), so if you are looking for a technical review of the OS, here’s an exhaustive review from ars technica. Talking about the OS itself, there are things I love about it, things I like, and stuff I hated already. 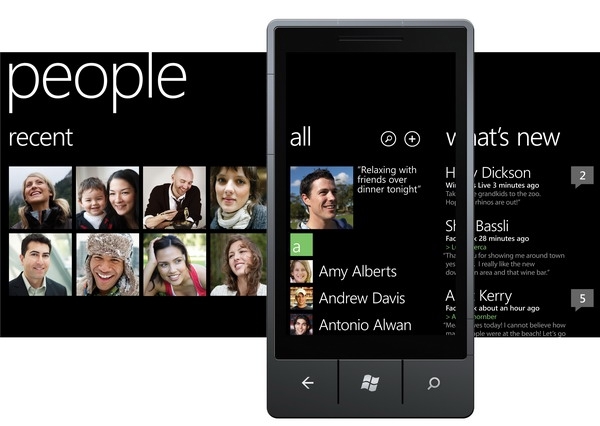 The look ‘n’ feel of the Windows Phone 7 UI is great, I like so much the minimalistic design, no round boxes, no shadows etc, just different sizes of text to differentiate the title of a page from its content for example. What I also like about Windows Phone 7 is the fact that you can use several services other than Windows Live for syncing contacts, calendars and emails. Gmail integrate pretty well, and if you have been an Android user like me, all your contacts can be imported just as easy as your Live ID contacts. The camera is awesome, when taking a picture, you just slide on the left side and you get the last pic you took, no menus to go through, very intuitive and simple. Animations also are pleasant, they don’t disturb your work, and are as fast as they should be to give a great user experience. Internet explorer is really fast and smooth with Bing search and voice commands, it is a pretty enjoyable experiment. Today, I had the chance to try the gps on the device and how fast and accurate it is, I was completely surprise, it is perfect, pretty fast, so responsive and accurate while used with Bing Maps. What I don’t like about Windows Phone 7 is mainly the features that lacks the OS and which have been discussed in (almost) every website reviewed the OS. You cannot change the ringtone (what a big deal right ;D ). More seriously, there is no copy past!! I totally hate the way Microsoft is playing Apple with its customers! The whole world knows that copy/paste is not that hard to implement on any OS, and hence MS has made the choice not to include it and not because it is a feature that they will *work* on on the future! While they have already promised for some updates by early 2011, playing Apple with Windows Phone 7 is “disgusting”, Windows Phone users are not iPhone users, and even if MS wants to play the game, does that mean it has to copy the iPhone 1 and let its users 4 years late compared to the other Mobile Operating Systems?? There is no way to take screenshots on the device!! how I am supposed to do reviews on the OS and apps then? Also, there is no sharing option for webpages, videos or even pictures and photos on social networks! you take a pic, you close the Photos app, you open Twitter app, then join a pic to share it! For a webpage it is simply impossible to share its URL, since there is no freaking copy/paste. The Filesystem is completely unknown for users (developers), there is an Adobe Acrobat reader app, but guess how you open pdf files?? whether you download them from the web and they get saved somewhere, or you download them from your email! there is no way to just put your pdfs on the phone to read them later. Multitasking, please don’t get me to start on this one! Samsung Omnia 7 rocks, with its 4inch AMOLED screen that puts the iPhone’s to shame (according to my biased opinion ^_^), the touch is just another great part of the device as well. With a 5 MP camera, HD video recording and 1GHz processor, I simply adore it. For a complete review about the device, take a look here. However, I find the search’s button (if it can be called so) position a little irritating, while holding the device in landscape mode, usually, your finger just press it unwillingly, since it is almost at the edge of the corner, but with time, you get used to it. But! the earbuds are a complete failure, the quality of sound is just good, but the way they have to be used is really irritating, first, when you put them you can hear nothing around you, literally nothing, you can get hit by a car without even noticing (hearing) it approaching. If you try to lower the volume on the earbuds to try to hear any extern voices, you will get an annoying sounds of the earbuds themselves when they touch your clothes, which makes them useless in the two cases. Remember that JJencode method that inserts $ everywhere and makes the code absolutely unreadable from the last post? well, if you liked it, then this one is going to be a real surprise for you.